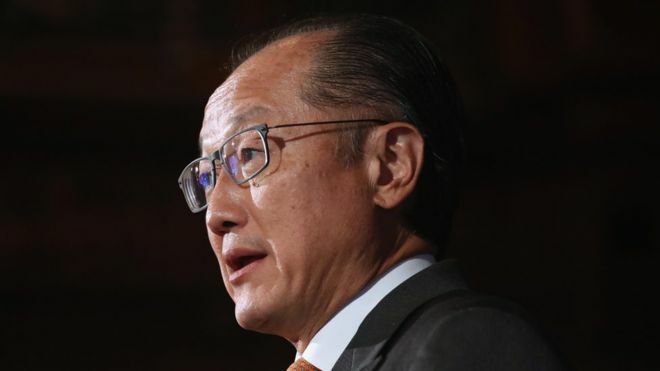 The world is on a "crash course" as people's hopes collide with a future in which millions of jobs are automated, the World Bank chief has said. Jim Yong Kim said policymakers should take action by investing in education and health. The World Bank president was speaking in New York ahead of the group's annual meeting in Washington DC this week. The remarks come amid wider concerns about political threats to economic growth. The World Bank plans to publish a ranking of countries that measures investments in "human capital", such as education. The focus is a shift for the organisation, which was established after World War Two to spur infrastructure reconstruction. But Dr Kim said other kinds of investments are important to economic growth in the future, as robots displace millions of low-skill workers. "The one thing you know for sure that you'll need in whatever the economy looks like in the future is people who can learn," he told the BBC. "We want to create a sense of urgency to invest in people that we think is necessary given the way ... the global economy is changing."